This amazing cake is a combination of two recipes. The source for the cheesecake is www.cakespy.com. The source for the carrot cake and cream cheese frosting is food52.com. Put them together and you get one yummy treat. Butter and flour two 8-inch round cake pans. Line the bottom with parchment paper and set aside. Grate the carrots on a medium grate, and set aside. Sift the flour, baking powder, baking soda, spices and salt and mix with the carrots to coat. Mix together sugar, brown sugar, eggs, yogurt, and oil. Pour this mixture into the carrot mixture and stir until just combined. Pour batter evenly into prepared cake pans and bake on the middle rack of the oven for 45 minutes. Reduce the heat to 325 and bake for another 20 minutes, or until a toothpick inserted in the center of the cakes comes out clean. Allow to cool for 15 minutes in the pans, then remove and cool completely before frosting. Prepare the cheesecake layer. Preheat the oven to 350 degrees F.
Melt the white chocolate, set aside to cool slightly. In a large bowl using an electronic mixer, mix the cream cheese on low speed until creamy. Add the sugar and mix slowly until smooth. On low speed, mix in the flour. Turn off the mixer and scrape down the bowl and beater with a rubber spatula. Add one egg at a time, mixing well after each addition, scraping the sides of the bowl. Mix in the vanilla and cream until the mixture is smooth. Using a large spoon, stir in the melted white chocolate until incorporated. Pour the batter into a parchment paper lined 9-inch spring form pan. Bake for about 30 minutes or until the center is set when you slightly shake the pan. Allow to cool before removing from the spring form pan. Allow to cool completely before assembling the cake. While waiting for the cheesecake and carrot cake to cool down, make the frosting. Allow cream cheese and butter to come to room temperature. In a stand mixer with paddle attachment, combine the cream cheese and butter until just mixed. Add vanilla and mix until combined. Add the sifted powdered sugar in four batches and beat until smooth, being careful not to whip the frosting. 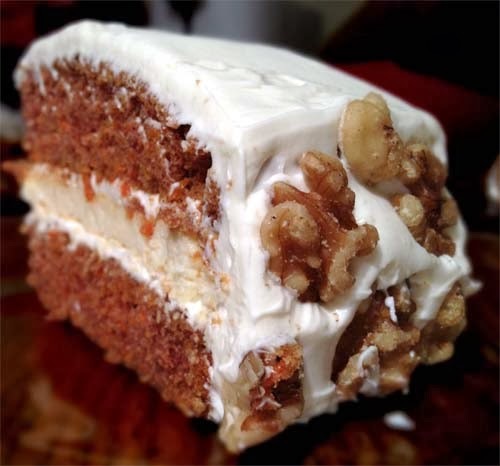 In final assembly, cut carrot cake in half horizontally to make a top half and a bottom half. Sandwich the cheesecake between the two halves and apply frosting. Serve and enjoy! For more treats with cheesecake filling, take a look at the recipe for espresso brownies.